Cast: Jack Nicholson, Leonardo DiCaprio, Matt Damon, Alec Baldwin, Martin Sheen, Mark Wahlberg, Ray Winstone, Vera Farmiga. Directed by Martin Scorsese, adapted from the huge Hong Kong hit Infernal Affairs. Story: Spies in the police, spies in the underworld. Running Time: 2hrs 27 minutes. The Departed is a pretty good gangland crime tale in true Martin Scorsese style, but it's not without its flaws. Firstly is the speed at which the plot begins. You'd better be paying attention or you'll lose the fact that Matt Damon is a copper secretly playing for the bad guys, and Leonardo DiCaprio is a bad guy who's secretly a cop, and Jack Nicholson is ... umm ... is he a secretly good baddie or a secretly bad goodie? Then he beats the snot out of shiny little Leo and it all becomes clear. Crosses and double-crosses follow, people die and it all goes a bit Scorsese towards the end. But then, you'd be surprised if it didn't, right? What you don't expect is for two of the main characters to have such similar names - Costillo and Costigan - adding to the confusion that was already rampant in my head. It all shook out in the end - well, nearly all - one of the key characters we were supposed to recognise at the end looked completely unfamiliar to me - but it shouldn't really have needed shaking in the first place. I daresay a second viewing will improve the experience, should the opportunity arise. Jack Nicholson is, as always, immensely watchable and never more so than when he's playing a nasty piece of work. Matt Damon, who to me has looked like a retard ever since I saw Team America, is excellent in a role that is a little out of stereotype for him, but Leonardo DiCaprio seemed a little out of his depth - maybe that was the point given his character's Donnie Brasco-esque role, but seeing him as a wiseguy just didn't flow. Worst is Mark Wahlberg, who I've had some praise for in the past, but here he can't muster the credibility for his obnoxious detective, and his delivery is too rapid, each line beginning before the previous one has sunk in. And it's too late for Ray Winstone to experiment with an American accent, we all know him too well as a Cockney by now. Having concentrated largely on its flaws, The Departed nevertheless has much going for it. It's still well worth seeing and the long running time passes very quickly. The performances are varied, but the story's good and there are several surprises tucked away in there. Worthy, but it could have been so much better. Testosterone Satisfaction Rating: 4/5 - plenty of mafioso style action, shootings, no Reservoir Dogs style nastiness, over 200 uses of the F word. To enjoy this film you should be: paying close attention from the outset. The Departed was released in the UK on 6th October. Once upon a time there were two little boys who joined the police force....... but would have been better off becoming professional rat catchers. The Departed is an excellent film from start to finish Billy Costigan (DiCaprio) and Colin Sullivan (Damon) both start out life on the streets of Boston's Irish American community, which is governed by gangster Frank Costello (Nicholson). Eventually both lads arrive in the police force and end up in a special unit dealing with organised crime led by Captain Queenan (Sheen) and Sgt. Dignam (Wahlberg). Without giving the story away Costigan goes deep undercover to get Costello and Sullivan is the rat in the unit riding shotgun for Costello. 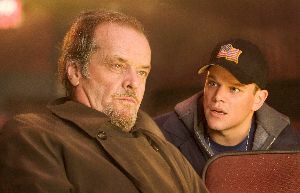 The cast list of The Departed is exceptional and there is a lot of talent for director Scorsese to draw on. Martin Sheen, Mark Wahlberg, and Alec Baldwin actually have supporting roles in this film (just as well for Wahlberg), it's DiCaprio and Damon with the leads and they don't disappoint, Nicholson (as always) is in top form but no-one is overpowered by the other and the film flows very nicely indeed over it's entire length, even Ray Winstone does not seem to mind his lower role. The film has massive amounts of intrigue and tension and once the first 10 minutes is done the audience knows where the battle lines are drawn and the cat-and-mouse games begin, the suspense begins to grow slowly (which is good) and you're kept on this crescendo till the very end. It's a gangster movie with lots of bloodletting and profanity with a good story and plot you won't be disappointed in seeing this, it's a great film. As others have said it's a good gangland movie, the real disappointment for me was the ending, the editor & director obviously couldn't work out a better way to intelligently close the film off and as the time was running on had to get to the point sharpish. whilst it was a very good twist I still think it could have been done better.